We will briefly explore diagnosis of dementia and differences between dementia types. 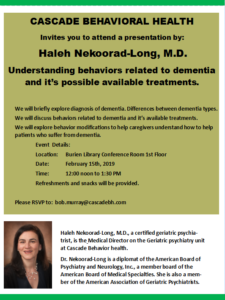 We will discuss behaviors related to dementia and its available treatments. We will explore behavior modifications to help caregivers understand how to help patients who suffer from dementia.